I've talked about my love for Kate and Sarah over at Our Best Bites before. I've never met either one of them, but I totally feel like Kate and I are bosom buddies. She grew up in Logan, Utah. I grew up there as well. So that makes us friends, right? Okay, so maybe we aren't friends, but I do feel a close connection with her whenever she talks about skiing at Beaver Mountain, or enjoying the food at Old Grist Mill. I think she (or Sarah) even mentioned this recipe once on Our Best Bites. I'm not exactly sure where I got this recipe. I believe it was one of my college roommates, and maybe even my best friend. My memory's failing me. 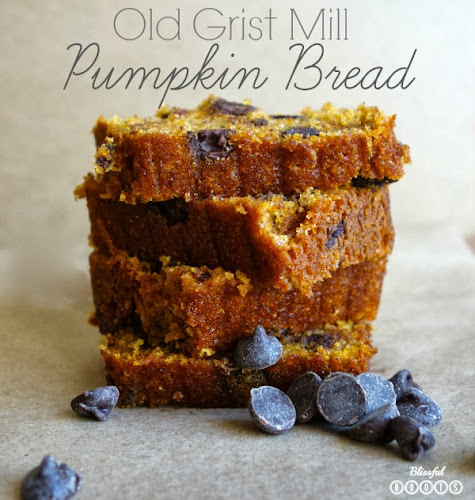 I'm not even exactly sure if this really is the Old Grist Mill recipe, but it sure tastes like it to me, and that's what I have written on my recipe card. 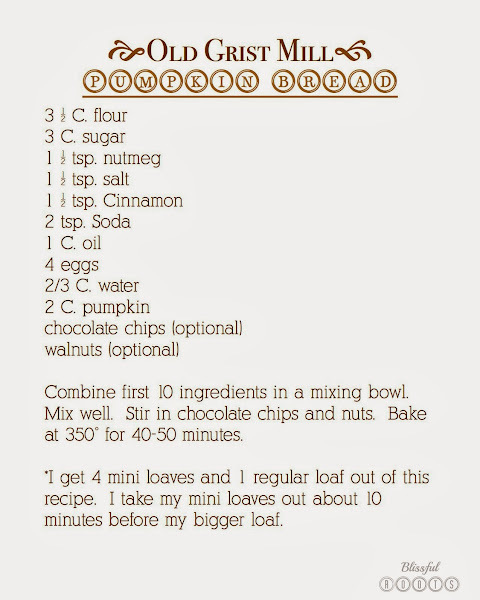 You have to promise me you'll try this recipe at least once, even if you have a favorite one already. If you don't LOVE it, then you can go back to your old recipe. 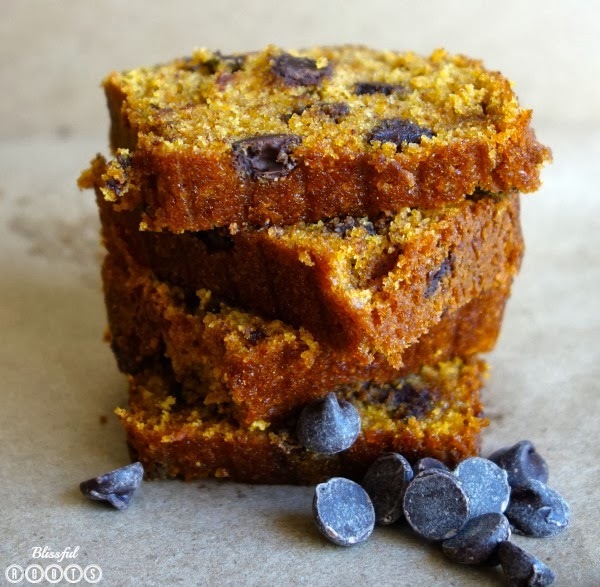 I have tried many pumpkin bread recipes over the years, but I keep coming back to this one. The flavor, the density, the chocolate chips, everything about this bread is exactly what I'm looking for when I'm craving pumpkin bread. This is delicious! It makes a lot of batter. I used two loaf pans, one had more batter and took over an hour to bake. It is better when its cooled off. I thought it would be good warm and fresh from the oven, but I actually liked it better once it cooled. I could eat the whole loaf myself!